Whether we like it or not, fall is upon us. 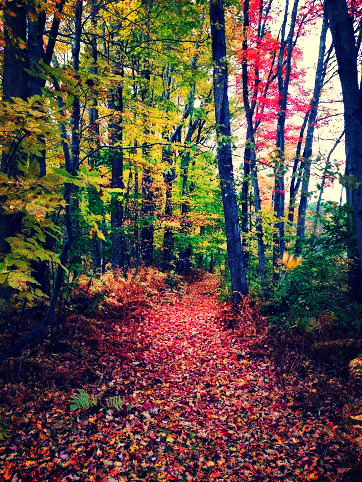 While the crisp and beautiful technicolor hues of fall are undeniable, it is also a time of huge transition, a time of mourning and of loss. Old stuff comes up this time of year, and if we don’t deal with it now it will follow us into the winter months, compromising our immunity and making us more susceptible to sickness and infections, especially those of the lungs. It’s quite appropriate to be dealing with the these emotions this time of year. In Chinese Medicine, this season is associated with grief. Luckily the “gift” of this season is inspiration. I find the lense of Chinese 5-Element Theory and the wisdom it offers to be a magnificent tool for understanding this time of the year and how it relates to our health and well-being. It views the body as a microcosm of the macrocosm of nature and its cycles. This is just one of many systems that are rooted in this earth-wisdom. If this system doesn't resonate I encourage you to seek-out these correlations in others that do! Fall is associated with the Metal Element, the emotion of Grief, the gift of Inspiration, and the organ pair Lungs/Large Intestine. Our culture has a huge problem with unresolved grief, and guess where it often goes? The lungs. As in chronic respiratory infections in the winter- deep coughs, bronchitis, and even pneumonia. I can’t tell you how many times I have heard clients make this connection when I explain this to them. SO many a-ha moments…..”After my mom died I had the worst case bronchitis…” Acupuncturists across the country reported a huge spike in lung-related illness the fall and winter post-9/11, because they noticed these things as it fits into their model of medicine. It’s important to acknowledge this sadness and feelings of loss this time of year so it doesn’t express itself later in the winter. Here’s a simple ritual: Write down on slips of paper, thought patterns,things, emotions, people, commitments, losses and attachments that you want to let go of. Light a candle and one by one feed your slips into the flame. Burning bitter herbs like mugwort and sage will aid this process. This is just one suggestion. Creating your own ritual can be a powerful practice. Cultures across the world recognize this time of year as the time when the veil between the worlds is the thinnest. Dia de los Muertos and even Halloween (which is derived from the pagan holiday Samhain) are living examples of this. Now is the time to set aside some time to remember those we loved who are no longer with us, making time and space to grieve. Acknowledge the emotions that well-up in us when we make this space; honor these emotions. Folks with a good dose of Metal in their constitutions tend to be very organized with homes that are streamlined and free of clutter. This is an outward manifestation of the energy and influence of the Metal element. Just like we can let go of all the emotional stuff we no longer need, we can do the same with all of our physical possessions and “stuff” in the world….further aligning us with the seasonal influence of the fall and get us in good shape for the winter. This outward practice will support our inward practice and work. In the version of medicine that I practice the mind and body are never separate. That’s why I consider practices like the ones listed above to be as important to good health as I do all the rest of the things- sleep, clean water, nutritious food, and so on. These practices can be supported by a few other fall adages. This season the cold and wind can dry us right up, agitating our nervous system and compromising the mucous mumbranes in our nose, throat and lungs that are our first line of defense against those invading pathogens that give us the inevitable sore throats and sniffles of the fall. These mucous membranes need to be moist in order to work best. Demulcent herbs with mucilage such as Marshmallow Rt + Lf (Althea officinalis), Cinnamon (Cinnamomum sp), Sassafrass Lf (Sassafrass albidum) in our daily teas can help with this greatly. As can chia sd, and the basic foundation of drinking enough water. If you burn a wood stove put a pot of water on it, or use a humidifier in your bedroom at night to keep yourself from drying out. This is another basic, but so important. Chinese Medicine considers cold to be one of the External Pernicious Influences…..aka things that get us sick! It is absolutely true that if you go to bed with a wet head of hair on a cold night you are much more likely to wake-up with that cold that’s going around. Simply blow-dry your hair and wear a hat to bed to avoid this and still enjoy evening showers and baths in the colder months. So bundle-up, get-out your scarves, hats, and warm socks; it's all health-building! I know this one is sooooooo hard to comply with :) The spices of chai are warming in nature and cow milk is moistening. If there is one season that chai is super appropriate for most people, this is it! Of course non-dairy milk for lactose-intolerant people is still the way to go….add extra cinnamon for extra moistening action. The fall is the time to tend to un-resolved grief and emotional baggage, and it’s the same with our bodies. Take the time now to work on un-resolved health issues that are bringing you down, so you can have a sweet, dream-filled, and healthy winter.